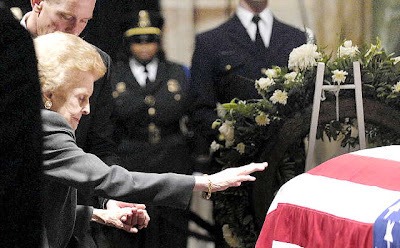 Our long national nightmare is over- Gerald Ford is finally burried! WTF, people? Its Jerry Ford! Lenin wasn't laid out this long. Okay, maybe he was, but still. The guy's funeral has already surpassed his term! not to help Mrs Ford put to rest her husband. I couldn't agree more! And it's the lead story on *every* news broadcast, for the last three days! Who cares? Am I missing something? So he was president, big effin' deal; apparently any moron can do that (see current office holder).